This is one of my most prized keepsakes from my youth. 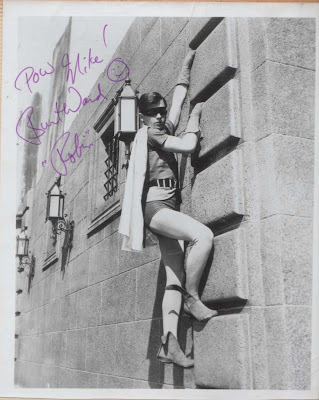 An autographed picture of Burt Ward (aka Robin) that I got in 1974 in Kokomo, Indiana. Ward was making an appearance at a local auto dealership and my parents took me out to see him. The Batman TV show had been canceled six years prior to my getting this autograph, but the show was still aired regularly in re-runs and would continue to be through much of my childhood. Texas Court of Criminal Appeals judges were ready to work late the evening Michael Richard was executed. They were expecting an 11th-hour appeal that — unbeknownst to them — Presiding Judge Sharon Keller refused to allow to be filed after 5 p.m.
Judge Keller was notified by one of the condemned man’s attorneys asking if they would accept the late appeal after the Supreme Court had ruled earlier in the day on lethal injections. Keller responded by shutting the doors promptly at 5 p.m. and the execution was carried out later that evening. There is now a moratorium on executions in Texas until the Supreme Court deals with the lethal injection issue, but Judge Keller through her actions made sure to get one more killing in that should not have gone ahead. I agree with these folks. Judge Keller should be impeached. It's great news about Sen. Pete Domenici, R-N.M., planning to retire. That means another clear pickup opportunity for Democrats. U.S. Rep. Tom Udall, D-N.M., is now considered the frontrunner for the seat assuming that former Gov. and presidential candidate Bill Richardson doesn't throw his hat in the ring. Udall's cousin, Mark Udall, a congressman from Colorado, is already the frontrunner to replace retiring Republican Sen. Wayne Allard in that state. More evidence of the Republican collapse in the Wall Street Journal the other day. the number of Americans who share some classic Democratic concerns has risen. Three-quarters of the population is worried about growing income inequality, Pew found, while two-thirds favor government-funded health care for all. Support for a government safety net for the poor is at its highest level since 1987, Pew said. "More striking," Pew concluded, was the change in party identification since 2002. Five years ago, the population was evenly divided -- 43% for each party. This year, Democrats had a 50% to 35% advantage. A new ABC/Washington Post poll has Bush’s approval rating at 33 percent. His lowest ever in that poll. Most Americans oppose fully funding President Bush's $190 billion request for the wars in Iraq and Afghanistan and a sizeable majority supports an expansion of a children's health insurance bill the president has promised to veto, putting Bush and many congressional Republicans on the wrong side of public opinion on upcoming foreign and domestic policy battles. Congress has a pathetic 29 percent approval rating, but when they break it out by party affiliation Republican lawmakers are at 29 percent and Democratic lawmakers are at 38 percent. And when the two parties are pitted directly against one another, the public broadly favors Democrats to handle Iraq, health care, the federal budget and the economy. The reason Democratic lawmakers get low marks is because a majority of Americans think they haven’t done enough to end the war in Iraq. Overall, 55 percent of Americans want congressional Democrats to do more to challenge the president's Iraq war policies, while only a third think the Democrats have already gone too far. The level of agitation for more action in opposition to the war has not dissipated since August 2005, when Democrats were the minority party in Congress. I wouldn’t want to be a Republican running for election in 2008 if the war in Iraq is still going on. The New York Times had a very interesting story over the weekend about the new rightwing political actiona group called Freedom's Watch. Freedom’s Watch has been serving as the rightwing counter to MoveOn.org and its campaign against the Iraq War. The group recently launched a $15 million advertizing blitz to support the “surge” and also counterattacked MoveOn.org over the controversial Petraeus/Betray Us ad. Among the group’s founders are Sheldon G. Adelson, the chairman and chief executive of the Las Vegas Sands Corporation, who ranks sixth on the Forbes Magazine list of the world’s billionaires; Mel Sembler, a shopping center magnate based in St. Petersburg, Fla., who served as the ambassador to Italy and Australia; John M. Templeton Jr., the conservative philanthropist from Bryn Mawr, Pa.; and Anthony H. Gioia, a former ambassador to Malta who heads an investment group based in Buffalo, N.Y. All four men are long-time prolific donors who have raised money on behalf of Republican and conservative causes. Who is Sheldon Adelson? Only the third richest man in the U.S. and sixth richest in the world according to Forbes. His net worth is $28 billion, which is more than three times that of leftwing boogieman George Soros. We have heard lots of sniping from the right about the millions of dollars that Soros has donated to liberal groups like MoveOn. So how come we don’t know anything about this guy Adelson who makes Soros look like a pauper? The reason, I believe, is that billionaires who support Republicans are a dime a dozen and thus not interesting to our sensationalist media. However, a billionaire who supports Democrats is extremely rare and thus it’s your classic ‘man bites dog’ story that gets all the attention. But it also leads rightwingers to falsely believe that they are somehow at a disadvantage when someone like Soros gives money to liberal causes. The truth is that Soros’ funding of leftist groups is drop in the bucket compared to the gusher of money that flows into rightwing coffers from the likes of Sheldon Adelson and Richard Mellon Scaife.